Students collected 820+ samples—an average of 15 samples per team—that generated over 700 sequences. An Ecosystem in a Drop of Water: Molecular Approaches to Surveying Aquatic Biodiversity in Urban Habitats. Garrett Friedman, Leo Satlof, and Spencer O'Flanagan. 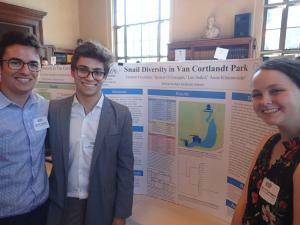 The winning team examined the relationship between water quality at various locations of Van Cortlandt Park and the species of snail present. Students collected more than 30 snails from three separate locations within the park and identified 6 different species through DNA barcoding. At each collection, site water quality measurements were recorded, as high fertilizer runoff and pollution affect the species that reside in the water. Results indicate that all locations investigated contained many more pollution-resistant lunged snails than pollution-sensitive gilled snails. The sixth year of the Urban Barcode Project concluded on May 25, 2017 with poster sessions at the New York Academy of Medicine, New York. Students collected 570+ samples—an average of 13 samples per team—that generated over 900 sequences. Allison Granberry, Jesus Bailon, Julia Martino, Nathalee Almonte, and Damon P. Little. Nathalee Almonte, Julia Martino, and Jesus Bailon, Hostos-Lincoln Academy. Mentored by Allison Granberry, Hostos-Lincoln Academy, and Damon P. Little, New York Botanical Garden. The winning team studied the biodiversity of a small urban forest, the Thain Family Forest in the Bronx, New York, by DNA barcoding individual roots found in soil samples. The results were compared to an “above ground” morphological data bank in order to determine if below ground plant material could characterize the above ground ecosystem. Results show that while five plant species were reliably identified, DNA barcoding roots did not resolve several other samples to the species level. More than one fourth of the species collected were an invasive species, the Eurasisan native Poa annua. The fifth year of the Urban Barcode Project concluded on June 3, 2016 with poster sessions at the Borough of Manhattan Community College, New York. Students submitted 850+ samples for sequencing—an average of 15 samples/team —that generated over 1200+ sequences. Thanks to all of the teams who submitted proposals, performed experiments, and presented project results at the poster sessions held at the American Museum of Natural History on May 27, 2015. Seven teams were selected to give oral presentations and compete for the grand prize at the UBP Symposium Award Ceremony on June 8, 2015 at AMNH. Students submitted 700+ samples for sequencing—an average of 14 samples/team —that generated over 900+ sequences. [00:03:30] Keynote – Susan Perkins, Ph.D. Thanks to all of the teams who submitted proposals, performed experiments, and presented project results at the poster sessions held at the American Museum of Natural History on May 27, 2014. Six teams were selected to give oral presentations and compete for the grand prize at the UBP Symposium Award Ceremony on June 2, 2014 at AMNH. Students submitted 500+ samples—an average of 13 samples/team —that generated over 800+ sequences. [00:07:05] Keynote – Mark Stoeckle, Ph.D. Thanks to all of the teams who submitted proposals, performed experiments, and presented project results at the poster sessions held at the American Museum of Natural History on May 29, 2013. Six teams were selected to give oral presentations and compete for the grand prize at the UBP Symposium Award Ceremony on June 5, 2013 at AMNH. [00:06:40] Keynote – George Amato, Ph.D. Thanks to all of the teams who submitted proposals, performed experiments, and presented project results at the poster sessions held at the American Museum of Natural History on May 31 and June 1, 2012. Ten finalist teams presented projects at the Symposium on Wednesday, June 6, 2012. Rob DeSalle welcomes the student finalists and congratulates them on the importance of their projects to wildlife conservation. Jesse H. Ausubel describes the history of DNA barcoding and congratulates the student teams on the diversity of their projects. What species are sold as "catfish" in New York City?